We are currently in the process of cataloging our entire museum collection so that it can be made accessible to researchers. This process will likely take two years in order to compile all digital images and all prior catalog and archival information. During this cataloguing process, researchers may contact us for information about specific types of objects or particular collections. A view of the interior space of the museum as graduate student Ashley Fiutko catalogs objects in the collection. We welcome the visits of researchers to the museum collection, but ask that requests for access be placed at least two weeks in advance of a visit. 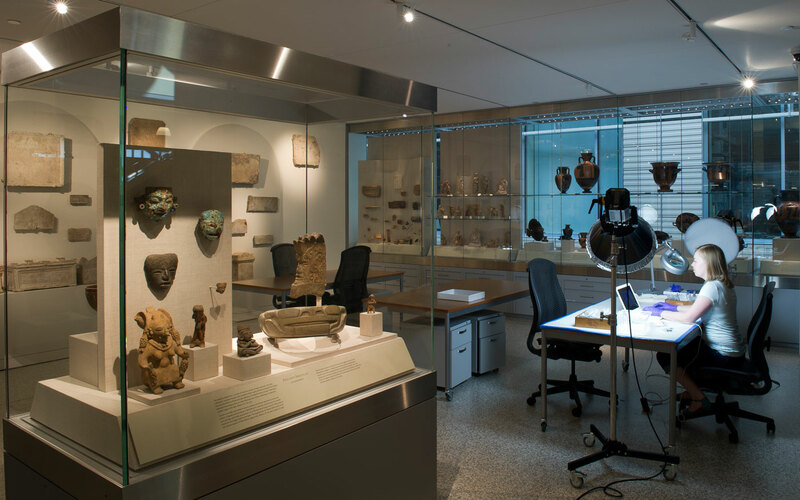 Please contact us for access to the museum collection and the use of its facilities. For researchers interested in publishing an image of our museum or of an object in our collection, please contact the curator. Permission to publish an image may or may not be granted depending on the type of use of the image. For researchers who require an image of an object in our collection for scholarly publications, please complete the Request for Publication Form and forward it to the curator (See contact us.) If an image already exists for the object, the image may be used, pending the museum’s approval. If no image exists for the object, an image can be provided upon payment of a $25 fee to the museum. This fee covers the cost of the image being taken by a professional photographer. A digital image of the object will be emailed to the researcher upon receipt of the $25 fee. Please note that all images of objects from the Johns Hopkins Archaeological Museum collection must be credited as stated by museum staff.